Two-thirds of the youth enrolled in WrapED are Indigenous. Given the systemic issues facing the Aboriginal community – Indian residential schools, foster care, high incarceration rates, poverty, intergenerational trauma – it’s not surprising that in the two and a half years the program has been operating in Edmonton that the numbers of Aboriginal youth are so high. Two-thirds of the youth enrolled in WrapED are Indigenous. Given the systemic issues facing the Aboriginal community – Indian residential schools, foster care, high incarceration rates, poverty, intergenerational trauma – it’s not surprising that in the two and a half years the program has been operating in Edmonton that the numbers of Aboriginal youth are so high, says Jodene McIsaac, program manager with Native Services Counselling of Alberta. WrapED is specific for youth who are at high risk of gang involvement. NCSA is one of six partners that collaborates for WrapED or Wraparound Edmonton. All the partners - Africa Centre, Edmonton John Howard Society, Edmonton Police Service, Native Counselling Services of Alberta, REACH Edmonton and YOUCAN Youth Services – work to provide full services or wraparound services, for the youth in the program. The systemic issues that face Aboriginal youth make them vulnerable for gang recruitment, says McIsaac. “For a lot of these young people (a gang) is the best support they have had. There’s a place to sleep, what they perceive is safety for them. They’re perceiving it as safe place to be. They’re seeing support. They have people around them. They’re not lonely. This is the information the kids gives us. It’s not the healthiest environment, but for them it’s a safe place where they feel their needs are being met,” she said. WrapED aims to provide that alternative support by lowering the numbers of children that each youth worker has assigned to them. By lowering the number, it allows the youth worker and the youth to establish a relationship. The support provided by the team ranges from help with school, employment, housing and income supports, as well as liaising between the court system and the young person and the children’s services system and the young person. Cultural programming is also provided for the Aboriginal youth in WrapED. 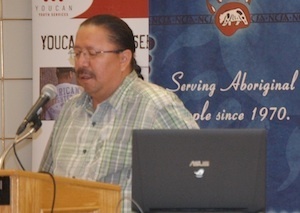 Connecting to culture provides stability, says Alexander First Nation Elder Andy Auigbelle. Auigbelle says a program like WrapED is important for youth, who want to be helped. Funding has been approved for five years for WrapED.